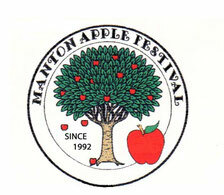 The Manton Apple Festival is held annually, the first Saturday in October. We feature quality, hand made arts and crafts, food of all kinds, local apples and apple products, and live entertainment. There is an apple pie baking contest, with cash prizes. The contest has two divisions, (adult and children). The proceeds from booth rentals and the apple festival pie booth sales help support a variety of local Manton non-profit organizations, as well as fund scholarships to support the educational goals of Manton area students.